It’s another beautiful South Dakota day. First stop is Mt. Rushmore. 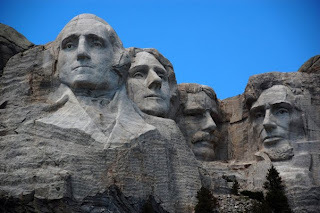 We’ve all seen many pictures of the sculpture in the mountain, but seeing it in person is really impressive. 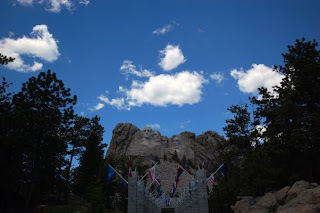 After saying hi to the presidents I headed over to Custer State Park. 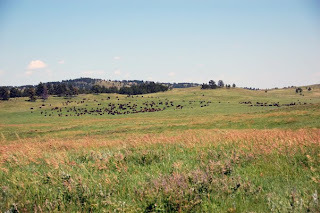 I had found a shotcut to go into the East side of Custer. The first four miles of the shortcut were dirt road. Now normally this is no big deal. The first half mile was pretty straight forward - graded dirt road. Then it turned a little ugly. Big ruts and washouts and a few water crossings. 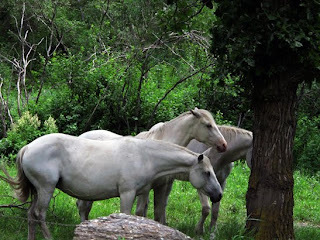 About half way I came across three very pretty horses. I don't really know much about horses, and have no idea what kind of horses they are, but they seemed to be pretty close to each other. 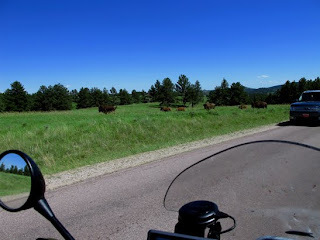 So after making it over my mini Dakar to pavement, I got into Custer State Park from the East enterance. 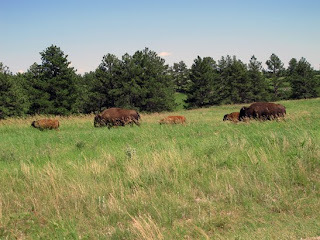 I headed to the "Wildlife" area of the park with hopes of seeing buffalo. 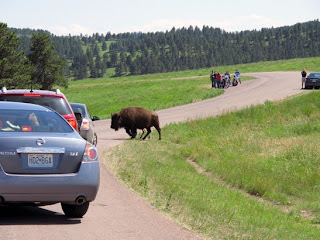 The road leading to the South section of the park, where the Buffalo Roam was good fun. A park lady said there were reports from earlier in the day of buffalo close to the small airport in the park. Shortly after the airport I spotted a herd of buffalo. They were prety far off, so I was a bit disappointed to not get a close look. After snapping a few pictures I started on down the road. I came around a corner and found three or four cars stopped in both direcions. I couldn't figure out why the cars were stopped at first and then found out why. A buffalo family was wandering across the road. 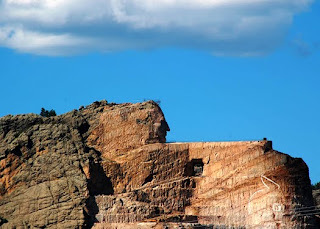 I continued on through the park and then onto the Crazy Horse Memorial. The memorial was started in 1948. It has a ways to go. 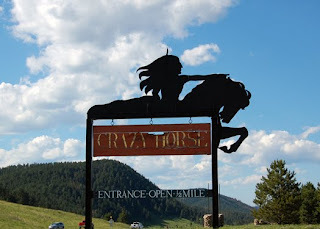 You can read more about the memorial at http://en.wikipedia.org/wiki/Crazy_Horse_Memorial. I didn't actually go into the facility, as you can see the carving from the highway. 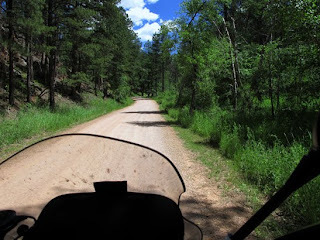 After taking a few quick pictures of Crazy Horse I set off for the hotel, but took some crazy twisty roads back through Black Hills Park. These are some of the tightest twisty roads I've ever been on. There are dozens of 10 and 15 MPH turns on one lane roads. Some of the turns are actually corkscrews in order to get up or down the mountian without having to rip up too much of landscape. It's hard to describe and not possible to photograph, but they have created corkscrew roads by building short 180 degree u-turn wooden bridges above a 180 degree u-turn on the road. Anyway it's pretty wild. Off to Sheridan, WY tomorrow.